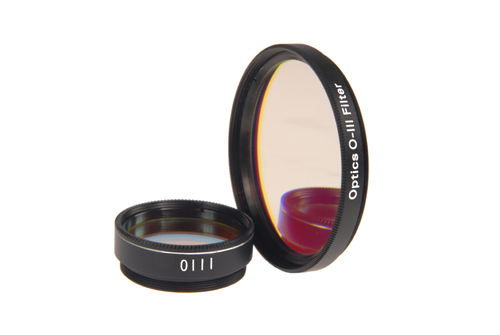 The O-III narrowband filter is specially designed for the observation of gas and planetary nebulae. It distinguishes different contrasts of the wavelengths of light that pass through, giving ideal conditions for the observation of faint super nova remnants and planetary remnants. The O-III narrow band-pass filter isolates just the two doubly ionized oxygen lines (496 and 501nm) emitted by diffuse, planetary and extremely faint nebulae. O-III filters work ideally with larger aperture telescopes in the 200mm and larger range. With larger aperture telescopes, observers will have a better opportunity to identify nebulae objects in the deep sky. It can produce near-photographic views of the Veil, Ring, Dumbbell, Orion, plus many other nebulae under dark skies. These Available in two sizes, threaded to fit either standard 1.25” or 2” astronomical eyepieces. Supplied with storage case.